Today The Memory Nest is sponsoring Sketchabilities - a sketch blog that "challenges you to get out of your comfort zone when it comes to paper and embellishments" (from the Sketchabilities 'About Us' page). Isn't that awesome? I know that I tend to fall back to what is familiar when I am working on a layout, and I love the challenge of using a sketch to help me break out of my comfort zone and try something new. Using patterned paper from Studio Calico, I created this layout based on Sketchabilities' latest sketch. Now I know it is Summer, and the pictures on this page are from Christmas, but my Christmas 2012 pictures are all I have left to scrap from last year, and I am bound and determined to get them done. This sketch was awesome! Not only did it get me to do something new for the title of my page, but it also inspired me to combine embellishments in an unexpected and unique way. I do not often layer my title on top of patterned paper, and if I do it is on a faint pattern. Following this sketch, I slipped pennants, cut from bold papers, under my pictures, and then layered my title on top. To be honest, I was a little apprehensive at first, not sure if I liked how this looked...but now I love it! 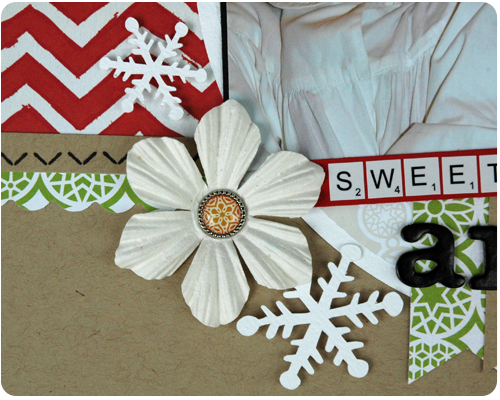 The title is written using Thickers from American Crafts and small letter stickers from Glitz. 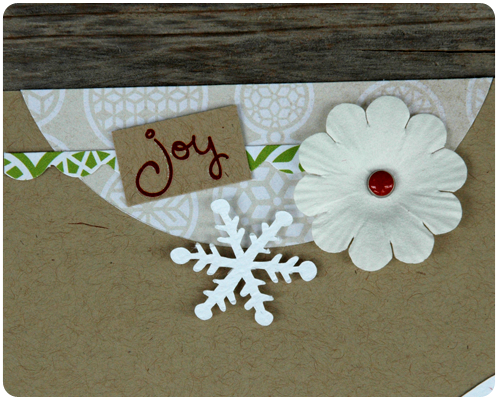 In keeping with the whole Christmas theme, I wanted to add snowflakes to my layout. Since there were flowers on the sketch I decided to add them to the layout alongside the snowflakes. I love how it looks - a little unexpected and really pretty. The gorgeous brads from Basic Grey tie in nicely with my photos and the color scheme of my page. Like I said, a great sketch to work with - clean and simple which matches my scrapping style, yet still encouraging me to try some new layering techniques and embellishment combinations. Awesome! 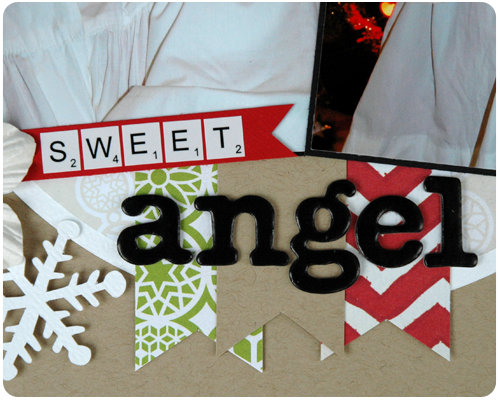 I am very happy with how this layout turned out....and that I have one of many 2012 Christmas layouts completed. Thanks for visiting Jennifer. I will stop by your blog and join up with your party for sure...thanks for letting me know about it.